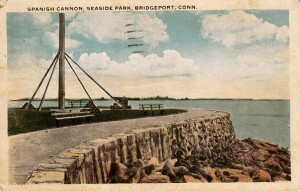 A cannon captured from a Spanish warship has been mounted in Bridgeport’s Seaside Park to honor the service of local residents during the Spanish-American War. 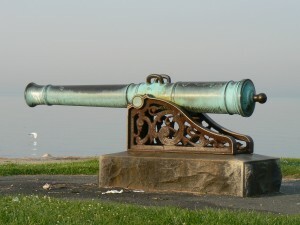 The bronze cannon, which faces southeast into Long Island Sound, was cast in Seville on December 13, 1794, according to a date inscribed near the cannon’s neck. We assume the intricate base, which could use a good rust treatment, is also original. 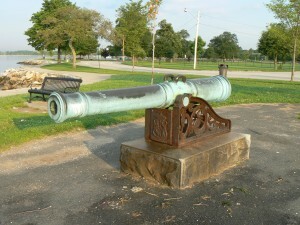 The green patina that covers part of the cannon has been worn away from the top of the muzzle and the handles by generations of children climbing and sitting on the cannon. 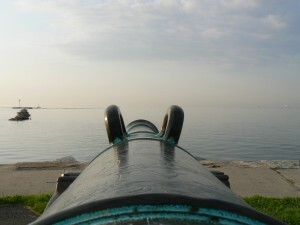 Immediately behind the cannon is a memorial plaque that was cast in 1913 from metal salvaged from the U.S.S. Maine, which sank in Havana Harbor in 1898. 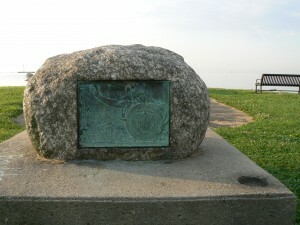 The plaque, designed by sculptor Charles Keck, is one of 1,000 that were cast. So far, we have seen identical plaques on display in Naugatuck and Norwich. As you can see from a vintage postcard, which bears a 1922 postmark, a ship’s mast and cannonballs were mounted behind the cannon. We couldn’t find a reference to the mast’s removal, but donating cannonballs that were decorating war monuments to scrap drives was common during World War II. 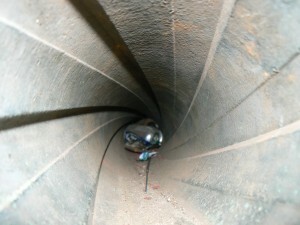 The last image demonstrates what you get when you poke a camera down the barrel of a cannon mounted in a coastal park.